Biography/Paintings of Florentine Mannerist Painter. The Florentine artist Jacopo da Pontormo was among the earliest exponents of Italian Mannerism. Influenced by Leonardo da Vinci (1452-1519) and Andrea del Sarto (1486-1531), he worked for the Medici, Borgherini and other patrons of Renaissance art in Florence, making his initial reputation with fresco works at the Medici villa at Poggio a Caiano. Like other Mannerist artists, Pontormo's compositional design took precedence over naturalism and perspective. Thus, where High Renaissance painters sought harmony, Pontormo looked for drama and special effect. His angular style of cinquecento draughtsmanship (evident in The Story of Joseph (1518, National Gallery, London) owed a great deal to works by Michelangelo (1475-1564) and Albrecht Durer (1471-1528), although his sense of colour was entirely his own. 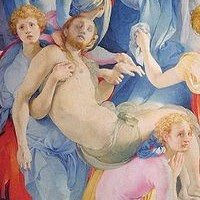 Pontormo is famous for two outstanding works: The Deposition (1526-8), painted for the altarpiece of S.Felicita; and a cycle of frescoes in the Church of S. Lorenzo (1546-56). In addition, his Portrait of Cosimo de'Medici Il Vecchio (1518-19, Uffizi, Florence) is one of the most richly coloured paintings of the Mannerist period. Best Artists of All Time. Although primarily concerned with religious art, Pontormo was also an exceptionally talented portraitist (Cosimo de'Medici Il Vecchio, 1518-19, Uffizi; Lady with a Lap Dog, c.1532, Art Institute Frankfurt), while he was a master of oil painting as well as fresco and tempera. In addition, he did some of the best drawings of the Renaissance. After Raphael (1483-1520) and Michelangelo, Pontormo remains the dominant personality of Florentine painting in the period around 1520. In opposition to the classicism of Botticelli (1445-1510) and Fra Bartolommeo (1472-1517), he placed his own personal style - tense, uneasy, unexpected and, sometimes, bizarre. His greatest pupil was Agnolo Bronzino (1503-72), and his rival Rosso Fiorentino (1494-1540). Born Jacopo Carucci in the Tuscan village of Pontormo, he trained - according to the biographer Vasari - under Leonardo, Piero di Cosimo (1462-1521) and Albertinelli (1474-1515), before being apprenticed (1512-14) to Andrea del Sarto, whose narrative style and ordered rhythms he copied (fresco of the Madonna and Four Saints, 1514, originally in the Church of S. Ruffillo, now in the Church of the Annunziata; Visitation, 1514-16, fresco in the atrium of the same church). Between 1515 and 1516 he decorated four panel paintings for the Borgherini family, in collaboration with Andrea del Sarto, Bacchiacca (1494-1557) and Granacci (1477-1543) (Story of Joseph, 1518, National Gallery, London). Soon after, he painted his first altarpiece, for the Church of S. Michele Visdomini in Florence, departing from the conventional framework of the sacra conversazione by superimposing long, subtly undulating curves (Madonna and Five Saints, 1517-18). The growing influence of Michelangelo, with his emphasis on contour, is particularly apparent at this period in Pontormo's drawing, inspired by the nudes in The Battle of Cascina. He may even, perhaps, have visited Rome to study the Sistine Chapel frescoes before his documented journey there in 1539. At any rate, by about 1518, Pontormo had already established his distinctive style of painting - full of movement, and marked by a disregard for normal rules of linear perspective, and colour values. Through the patronage of Cardinal Ottaviano de' Medici, Pontormo painted a famous portrait of Cosimo de'Medici Il Vecchio (1518-19, Uffizi), noted for its rich warm reds, and was then asked to help decorate the great entrance hall of the Villa at Poggio a Caiano. The series, commissioned by Pope Leo X in memory of his father Lorenzo the Magnificent, was carried out by Andrea del Sarto, Franciabigio (1482-1525) and Pontormo, who was responsible for two opposite lunettes pierced by a bull's-eye window (oculus) in the centre. On the death of Leo X the work was left unfinished. Pontormo had completed only one of the lunettes (Vertumnus and Pomona) but it is one of his happier works, a masterpiece of Florentine Mannerism, full of fantasy and elegant arabesques. In the Carthusian monastery of Galluzzo, near Florence, Pontormo executed a cycle of fresco paintings on the theme of the Passion (1522-4), to which he later added a canvas, The Supper at Emmaus (1525, Uffizi; the whole series, greatly dilapidated, has been detached and replaced with copies by Jacopo da Empoli). The influence of Durer's prints is unmistakable and has often been remarked upon, but the work as a whole is also noteworthy for its dramatic power, its contorted forms, and high degree of linear tension. The same tension can be seen in his early masterpiece - the altarpiece of the Deposition in the Capponi Chapel of S. Felicita in Florence (c.1526-7). More accurately termed a Lamentation, - as neither cross nor tomb appear, but only weightless figures lost in a trance of grief, able only to express their feelings in tender gestures - the work's remarkable harmonies are complemented by an exquisite decoration in fresco of the Annunciation and the Evangelists. The Visitation in the Church of S. Michele on the outskirts of Florence (c.1528) features four figures instead of the customary two, set against an architectural background and forming an undulating unit painted in tones of faded red and yellow. Restless rhythms, unstable figures and broken lines are again found in The Legend of the Ten Thousand Martyrs, painted for the Spedale degli Innocenti in Florence (c.1529-30). Michelangelo's influence still underlies the whole concept. As far as portrait art goes, the portrait of Alessandro de'Medici (c.1525, Lucca Museum) is the first of a series showing elongated, slim figures in complicated poses silhouetted against neutral backgrounds (Portrait of a Halberdier, c.1527, Chauncey Stillman Collection, New York). Apart from preparatory sketches, no trace remains of Pontormo's decorations for the villas of Careggi (1535-6, for Alessandro de' Medici) and Castello (c.1537-43, for Duke Cosimo). Painted across the walls of the partly open loggias in the entrance courtyard, they showed allegories of the Virtues and the Liberal Arts. Pontormo was known above all in his later years for his exquisite drawing, Around 1545-9, he supplied cartoons for two tapestries of the Story of Joseph (Quirinal Palace, Rome) as part of a series of 20 scenes commissioned by Duke Alessandro for the Palazzo Vecchio, in which Bronzino and Salviati also collaborated. This tapestry art reveals the monumental character of Pontormo's late style, which reached its apogee in the great undertaking of his last ten years, a commission from the Medici family for the frescoes in the Church of S. Lorenzo (1546-56). Painted on two levels on the three walls of the choir, they were left incomplete by Pontormo and were finished by Bronzino. The frescoes were destroyed during the 18th century, but the general layout of the whole work is known from old descriptions (for example, by Giorgio Vasari) and from Pontormo's diary (Florence Library), which contains references to S. Lorenzo in the two years before his death. A series of some 30 preparatory sketches, mainly executed in black chalk (most in the Uffizi), is all that remains of Pontormo's last masterpiece. Groups of astonishingly entwined nudes connect the various scenes of the Fall, the Flood and the Resurrection. In their breadth of vision the frescoes resemble Michelangelo's work in the Sistine Chapel, and project a plastic force and dramatic tension which were completely beyond the comprehension of his contemporaries. Pontormo was an isolated figure among the artists of his day. His individuality, akin to that of Rosso, ruled out any ideas of a studio. He had some imitators, such as Naldini and Morandini, and El Greco, but few pupils, with the exception of Bronzino, whose mannered techniques prolonged the maniera fiorentina well into the 16th century. Certain works of Jacopino del Conte, Vasari and Salviati, with their echoes of Pontormo's style, only serve to emphasize the level of his achievements. Paintings by Jacopo Pontormo can be seen in many of the best art museums throughout the world, notably the Uffizi Gallery in Florence. For biographies of more Mannerist painters, see: Arcimboldo (1527-93), Parmigianino (1503-40), and Jacopo Bassano (1515-1592).  For profiles of the major art styles/movements/periods, see: History of Art.  For more biographical details about famous painters, see: Homepage.